Nordhavn’s most buzzed-about forthcoming model, the 59-foot Coastal Pilot, is nearing completion and will ship from the factory this spring. Last month, Pacific Asian Enterprises' (PAE) vice president, Jim Leishman, traveled to the South Coast factory in China and shot some raw footage of hull #1 which is in its final stages of construction. Snow is in the forecast for the north, still the cruising atmosphere was rampant at the New York Boat Show last week. Nordhavn came off a very successful first foray in New York, which provided an ideal platform to launch the winter boat show season. 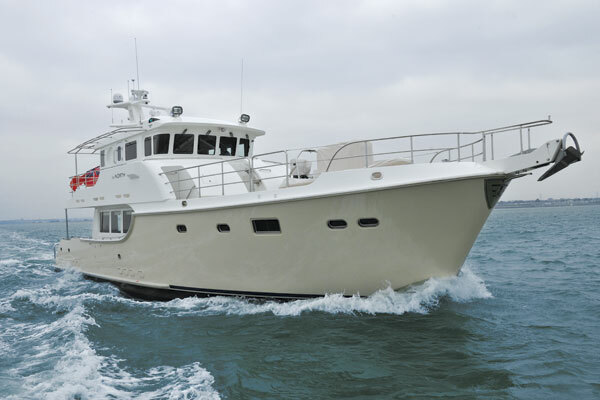 The first Nordhavn 96 is slated to arrive in Florida the first week of February. She’ll undergo commissioning at the Nordhavn East Coast commissioning facility in North Palm Beach. One of the most gorgeous Nordhavn 68s ever manufactured left Dana Point, CA, last week bound for Mexico on what is her first major journey. A convoy of Nordhavns set sail yesterday from Key West, bound for Havana, Cuba, marking the first time a group of Nordhavns has explored the waters around the island nation.